In February we embarked on a diy project that was overdue by 14 years. We ripped out our old kitchen and put in a new one. We managed to get most of the new one in the week that hubby had taken off work to do it, and over the last few weeks we’ve been finishing it off. It’s still not quite finished, but enough of it’s done to start making some things for it! One of the things that I absolutely love about it are the beautiful wooden worktops. The only issue is I’m worried about ruining them! In the old kitchen I got the tea stains out of the laminate worktops with bicarb and vinegar, but I don ‘t want to use anything that harsh on the wooden ones. So I had plans to make a pretty cloth to line a tray. Unfortunately, all the trays in my house currently contain half finished lego models and I didn’t get round to buying another one. 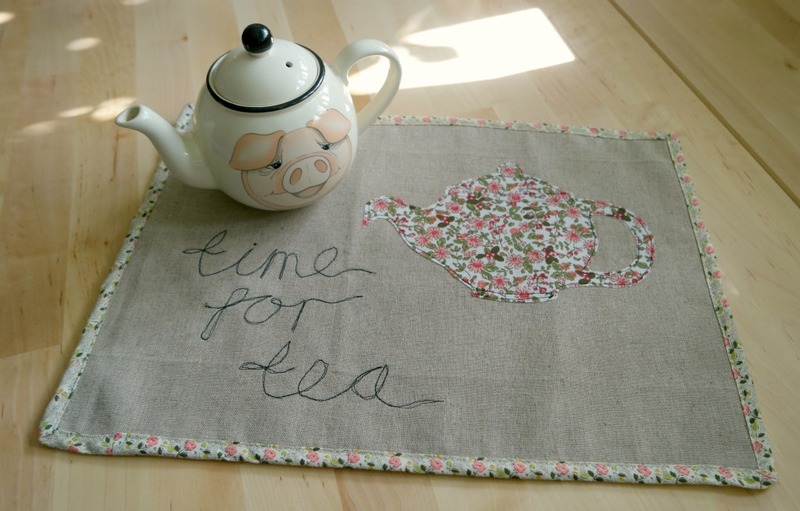 So the tea tray cloth has become a tea mat instead! To make it I used some linen (tea coloured already so the stains won’t show!) and some pretty floral fabric. I also used some sew in interfacing to give it some more weight. I used machine embroidery to applique the teapot and embroider the letters. It was the first time I’d tried machine embroidering letters, and I’m happy with how it’s turned out! I went over the letters twice as they looked spidery after the first time. Having an embroidery foot really helped as it allowed me to see what I was sewing! If you read the post I wrote about sewing machine feet, you’ll know that I don’t believe that having lots of feet is necessary. However it can be useful to have particular feet for certain tasks, and using an embroidery foot definitely made it easier. 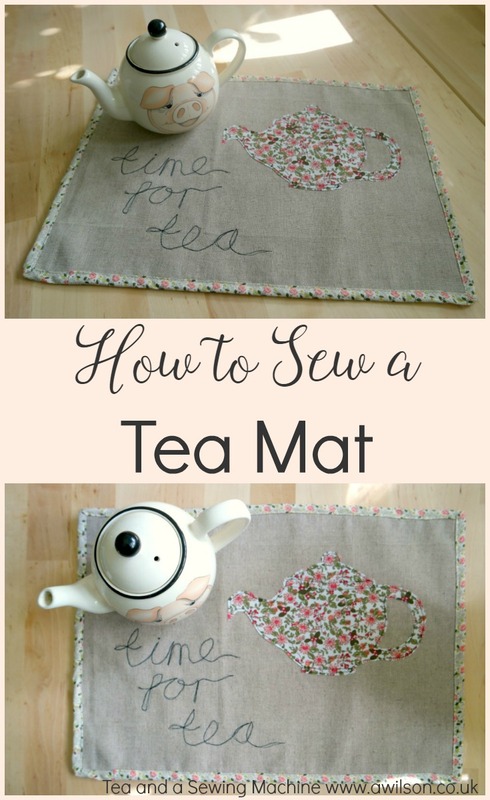 You can find the full tutorial for the tea mat here on the Minerva Crafts Bloggers Network. There are free templates for the teapot and the lettering too. These are affiliate links for the stuff I used to make the tea mat. Such a sweet idea! It would make a lovely house warming present for a friend! I absolutely love this! I will try it must. If you have any more easy sewing projects for beginners like me please don’t hesitate to share the love! Thanks in advance! 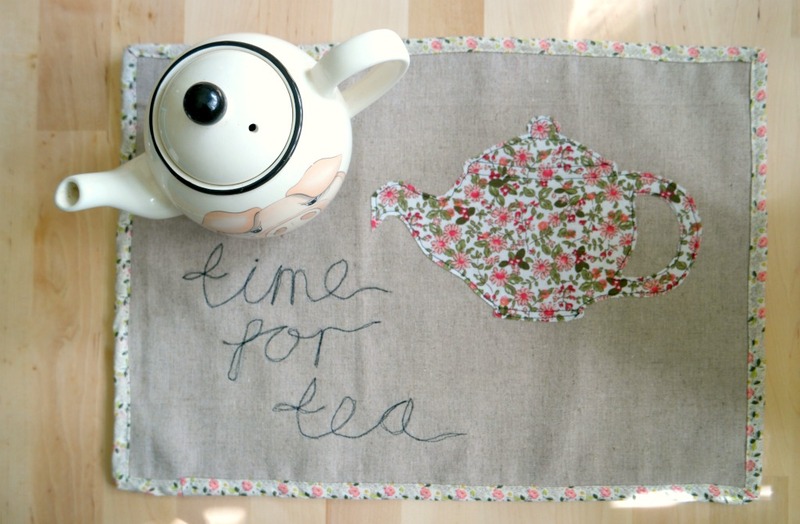 Love tea, love sewing – did you make this just for me? !